As a test-case, we compared the influence of Cicero and Caesar during the early imperial and late imperial periods. The methodology we outline in this article can be used on any number of source and target authors, regardless of language. Our formula for calculating the strength of an intertextual signal can be used with any tool for detecting intertextuality (not just Tesserae). Relative influence in our methodology is compared according to the ‘rate of intertextuality,’ which is a normalized representation of the number of results you get in a Tesserae search. Normalization is necessary because the length of a work influences the number of results obtained. Previous methods of normalization assumed that Tesserae’s scoring algorithm would perform consistently across various authors and genres of literature. We propose that best practice should avoid such assumptions wherever possible. We define the rate of intertextuality as the number of connected phrases per pair of phrases considered. This is derived by dividing the absolute value of the set of results by the absolute value of the cross-product of the sets of sentences in source and target texts. This cross-multiplication is necessary because Tesserae compares every sentence in a source text to all of the sentences in a target text.6 Therefore the number of possible results in a comparison of any source and target is the product of the number of sentences in the source and the number of sentences in the target. This appendix contains the intertextual parallels that inform the paper “Measuring the Presence of Roman Rhetoric: An Intertextual Analysis of Augustine’s De Doctrina Christiana IV” published in Mouseion Vol. 14 No. 3, Open Digital Corpora of Greek and Latin. The search parameters for these comparisons are listed at the beginning of each file. Please direct any questions to Caitlin Diddams at acstaab@buffalo.edu or James Gawley at jamesgaw@buffalo.edu. This paper examines the intertextual relationship between Augustine’s De Doctrina Christiana IV and Cicero’s Orator. We use quantitative methods to compare Augustine’s level of engagement with Orator against his engagement with other handbooks of classical Latin rhetoric. Our results inform a close reading of the text as body metaphor in DDC 4.13. Augustine incorporates Ciceronian colometry into his presentation of the epistles to demonstrate Paul’s eloquence. We argue that Augustine’s comparatively heavy use of Cicero is an attempt to justify the use of rhetoric in Christian teaching while adapting that rhetoric to Christian purposes. A “lemma-based search” identifies the co-occurrence of the same word with different inflections, and this is the basis for version 3.0 of the Tesserae software. In a benchmark test of Pharsalia 1 vs. Aeneid, 55% of parallels previously noted by commentators were retrieved by lemma-based search. Previous posts have discussed the method of generating metonym (synonym, antonym, hyponym, etc.) dictionaries through the application of topic modeling. In order to capture more of our target intertexts, we worked to generate the most accurate possible metonym dictionary, then combined it with lemmatization in order to simultaneously capture different inflections of the same word and metonyms of that word. In a repeat of the benchmark test above, the new ‘synonym + lemma’ feature retrieved commentator parallels at a rate of 68% (other search settings remained the same). View a version 3.1 synonym + lemma benchmark test. 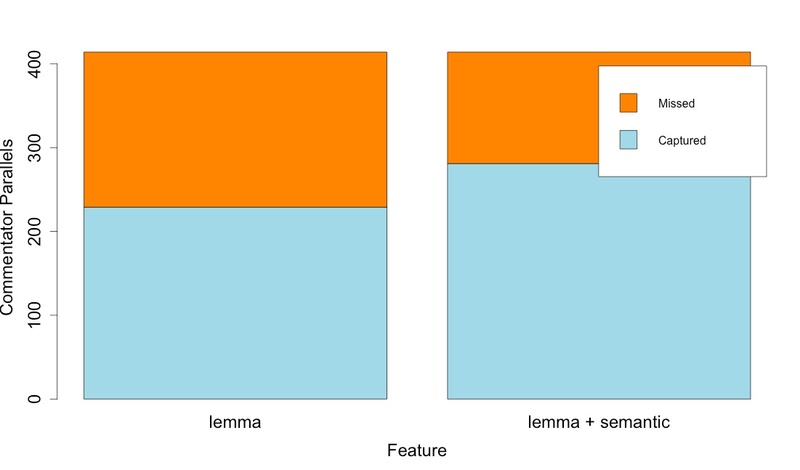 View a version 3.0 lemma-based benchmark test. As mentioned in previous posts, the Tesserae team has been working to create a digital Greek to Latin dictionary to aid in the retrieval of cross-language text reuse. Tesserae interns Nathaniel Durant, Theresa Mullin, and Elizabeth Hunter collectively assessed 1,000 Greek words, determining which, if any, method for producing a cross-language dictionary produced accurate translations. The winner proved to be an enhanced version of Chris Forstall’s topic-model-based ‘pivot’ method. It was very important to us that we retain at least 1 accurate translation. It was very important to us that we avoid retaining inaccurate translations. Because we have two possible translations for most words, it proved best to use two different similarity-score cutoffs for translations A and B. The result is a Greek-to-Latin dictionary which correlates 34,000 Greek words with at least one semantically related Latin word. We have reason to believe that this dictionary is accurate at at rate of 75%-80%, according to our own parameters for accuracy (because we are searching for allusions, this is not a ‘translation’ dictionary; we consider antonyms and all other metonyms to be valid associations). Publications on our methodology are forthcoming. For now, please experiment with the tool at http://tesserae.caset.buffalo.edu/cross.php. We welcome your feedback. The following data is the basis for an article entitled: “Paul is the New Cicero: Repurposing Roman Rhetoric in Augustine’s De Doctrina Christiana,” under review with the Journal Mouseion. These files are archived here for the benefit of readers who wish to inspect the results of Tesserae comparisons in greater detail than is possible in the article. The first file contains the results of a comparison of Augustine’s De Doctrina Christiana to Cicero’s Orator. The following links lead to comma-separated-value (CSV) files which can be opened in any spreadsheet editor. A comparison of Book 4 of Augustine’s De Doctrina Christiana to Caesar’s Bellum Civile with multitext results drawn from Cicero’s Orator. A comparison of Book 4 of Augustine’s De Doctrina Christiana to Glass’s Washingtonii Vita, with multitext results drawn from Cicero’s Orator. A comparison of Book 4 of Augustine’s De Doctrina Christiana to Tacitus’s Dialogus, with multitext results drawn from Cicero’s Orator. A comparison of Book 4 of Augustine’s De Doctrina Christiana to Tacitus’s Germania, with multitext results drawn from Cicero’s Orator. runs: each line represents a single comparison and its details. scores: coded by the numbers found in the ‘runs’ file, each row represents the number of results returned at a given score level. Knauer’s original commentary on the Aeneid listed places of parallelism with Homer’s Iliad, but did not specify criteria for intertextuality. The Google Docs spreadsheet below uses Knauer’s citations of the Aeneid, Book I, with his citations of the Iliad and lists the verbal correspondences between the Latin and the Greek. This work began in September, 2013 and has been intermittently edited and expanded up until June, 2014, when it has been mostly completed. It is free to use with credit to Tesserae and Konnor Clark, who compiled the list. Below any interested parties can find the birth and death dates for the authors of our corpus, as well as the putative dates of composition. We use this data to build visualization graphs of intertextual relationships. As explained by Chris Forstall in his earlier post, we are currently experimenting with a new cross-language detection feature over on the Tesserae Development server. We are using two different approaches, and the naïve Bayesian alignment approach bears a little explanation. The purpose of this post is to provide a simple introduction to the theory behind the algorithm; a link to my PERL script which aligns two texts in Tesserae format will be provided at the end. This time, the sentence from language B doesn’t contain βιβλους or ἀναγιγνωσκειν, so it’s less likely that either of those are legitimate translations for Amo. Φιλω has also appeared again, so the probability assigned to a possible Amo/Φιλω alignment is increased. Because Bayes’ theorem works backward from translation to antecedent, the application of this theorem in text alignment can look a bit complicated. This is how it works: to determine P(A|B) for any given Latin word, the program looks at all the sentences (actually Bible verses in our corpus) which contain that word. We’ll call this Verse Group 1. The program then gathers up all the Greek words in the corresponding Greek verses. These Greek words are our translation candidates, and we look at each of them in turn. To calculate P(B|A) (the probability of the original Latin word, given the current Greek translation candidate), the program looks at all the Greek verses which contain the translation candidate. We can call this group of verses ‘Verse Group 2.’ The program then gathers up all the Latin words in the Latin versions of Verse Group 2. The important factor here is that we’re grabbing a different set of verses than those in Verse Group 1. The amount of overlap between Verse Group 1 and Verse Group 2 depends on how good a translation candidate we’re looking at. In other words, when we look back from Greek to Latin, we may find verses that don’t contain the original Latin word under scrutiny. This is especially true if the Greek translation candidate is not actually the word we ultimately want; if we are looking at the wrong Greek word, we’ll end up gathering a bunch of Latin verses which don’t contain our original word and that will lower the value of P(B|A). The rest of the program is what my high school Physics teacher used to call “plug and chug.” ‘Probabilities’ are really just the number of times that a given word appears divided by the total number of words in the group in which it appears. An important feature of this approach is that for each word we examine, the program returns the probability of an alignment between that word and each possible translation word–just like in the first set of sentences at the top of this post. Many tools for this type of operation can be found online; a popular one is mGIZA. My own code for this project can be found on github. Feel free to ask questions or leave feedback in the comments section. When the Tesserae tool is demonstrated to Classics researchers, the most frequently asked question by a wide margin is: “When can you add my text?” It’s a fair request, and a testament to the interest in computer-assisted investigation of intertextuality. Our answer to date has always been “we’re working on it.” This has not been a brush-off; in fact the rapid addition of new texts to our searchable corpus has been one of, if not the top priority of the 2012-2013 academic year. I am pleased to report that we have increased the size of our searchable corpus by a factor of 10, from approximately eight hundred thousand words at the beginning of the 2012-2013 academic year to over eight million words at the time of this writing. There are other development teams on the Tesserae project which never stopped growing the functionality of the system while my team worked to expand its reach. The results can be seen in (among other things) the new multi-text search, and the much, much faster back-end we now enjoy. 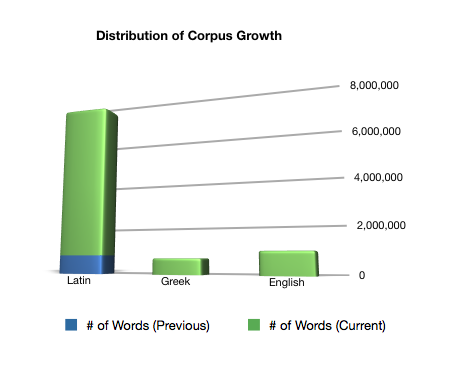 The massive increase in the Tesserae corpus is the result of a team effort. Veterans of our scoring team returned and were joined by fresh faces who contributed to a deep talent-pool as attested on our personnel page. We were also given a much-needed boost by Chris Forstall, as I will explain. Our goals for the year included the incorporation of the entirety of the Perseus classical corpus into Tesserae and the addition of important work in the English language. In order to add the texts from the Perseus database, it was crucial to preserve the hierarchy of text, book, and line-number with which the works were already annotated. Tesserae makes use of these markers and to strip the information out would be a waste. Yet there were several obstacles. First, Perseus texts were added and annotated by many different researchers over a period of several years. Each text presented unique problems to its annotator. Where these problems repeat themselves, a single annotator might solve them the same way each time–but different annotators developed unique solutions. This complicated Chris Forstall’s task of creating a universal parser for the Perseus XML. In addition, some of the variation in the XML-structure of the annotated texts is a natural result of differential structure of the works themselves. Plays are not organized like novels which are not organized like histories. The variety of structures is hinted at in Chris Forstall’s blog post. What is worse, several authors have been overly complicated by their textual tradition. Take Cicero, for example. At one point, Cicero’s works were organized by text and chapter. These chapter numbers were based on the page numbers of a very early print publication, and they often break up the text mid-sentence. Later tradition re-divided the work into text, book, chapter, and line–often interrupting the old divisions. Modern texts still include the old chapter numbers as well as the new. The researchers at Perseus, in their effort to faithfully reproduce the information contained in a print volume, include both numbering systems simultaneously in the XML structure of the text. Untangling these conflicting annotations correctly is time-consuming; luckily we were able to rely on the wise counsel of John Dugan and the tireless efforts of Anna Glenn in order to incorporate every single text in Cicero’s oeuvre into Tesserae. For those who aren’t aware, that’s a good chunk of Latin. Cicero’s works contain nearly half of the words in the existing canon of classical Latin. That’s an increase of 1,031%. It was made possible by the initial work of Chris Forstall, who developed a universal XML-parsing tool for use on the Perseus corpus, and the sustained efforts of our force of volunteers. The increase has been so dramatic that we are currently considering new methods of organization to relieve the now-overburdened menu system. In addition, still more texts are being processed even as I write, so if you’d like to make sure your particular text will be incorporated into the corpus, feel free to drop us a line, and be assured: we’re working on it.